Nobody likes to see their hair coming out. Hair loss affects many people and can be a frustrating affliction. This is a guide about remedies for hair loss. Years ago, my mama was a caregiver to a very health conscious lady. She had two "healthy hair" hints that mama took to heart and still uses to this day and so do I. When your hair is dry or brittle, it needs "feeding". Put enough olive oil in you hair to completely cover your scalp and hair. Wrap with saran wrap or some type of plastic wrap. Keep it covered at least one hour. Use regular shampoo to wash out. Take a kelp supplement, available at most drug stores. Because of strong meds (pneumonia) I have on occasion lost a lot of hair and it was then that I would remember this very lovely lady's hint. It works. Good luck and many happy hair days. When I was a little girl, my mother brushed our hair very vigorously with a brush to bring up the blood from the scalp to nourish the hair follicles. Then she made us wash our hair with shampoo two times followed by a vinegar rinse using 1/4 vinegar to 1 quart of water. This not only brought down the oils from the scalp, but conditioned our hair. Vinegar is a natural hair grower and anti-fungal that will make hair grow and heal as it works. I am in a hair fashion emergency. I dyed my hair back to its original black color about a week ago. I relaxed my hair today. I was washing it out and all my hair started falling out in clumps, I freaked out and had a panic attack. Now my hair is very thin and looks and feels weak. I have a weave sewn into my hair and now the hair that is suppose to cover the track is gone or the hair is very short like it was cut or chopped off. I need to know if there is something that I can use to cover up the area where the tracks are showing and make the hair look longer, fuller or thicker until the hair starts to grow back. Is there a hair mousse that I can use or spray? Or maybe clip ons? I don't want to spend a lot of money just to fix one spot or area of my hair. Where can I go to find a clip on piece for no more than $20-30? Also I need the mousse or spray to have a coloring effect as well because now the hair that was dyed had changed color to like maybe a cooper or a brownish color. I am traveling this week to a very important event and I cant have my hair look like this. Can somebody help me please? Call a few dollar stores and ask if they sell clip-on hair pieces. Also call a beauty supply store and talk to the employee who is a licensed cosmetologist. They will be able to help you. I don't know how much clip on hair pieces cost, but I've seen them in Ulta and I think Sally's Beauty Supply. ohhh.. :( My daughter did this about 5 yrs ago against my better judgment. She is still paying the price. The best thing to do is get to a salon, or your regular hairdresser. My daughter has to go at least every 3 months and does not buy over the counter hair products any more. Ohhh no...so sorry this happened! I was a licensed cosmetologist for quite some time, and I dealt with all sorts of these emergencies. First you must rid yourself of the idea that this is a hair FASHION emergency, it is far more than that. It is a hair health emergency, and how you deal with it now will have a lot to do with how your hair fares in the future. First, I hate to break the news, but in order to get your hair back on the right track, you really need to avoid the weave, extra additives, and color at least for now. I know you are not going to like this but your safest bet right now would be to go natural for at least 6 months, and have the damaged hair cut off. The reason is, your hair and scalp were traumatized. The current damage will travel up the hair shaft if you do not remove it, and weaves, braids, styling aids and chemicals will only cause more stress on your scalp. I would recommend finding a stylist who is good with chemical free styling as well as other types of styling, and give your hair and scalp a rest for at least 6 months before you even contemplate anything else. At that point I would definitely consult with a professional before any chemicals are applied. For future reference, there are colors which can be used the same day as a relaxer. They are not permanent but they are also not damaging. Consult a professional about these things as well before you try any. Although you may not like my recommendations now, you will be amazed how much progress you will make in 6 months time, and you may like the low maintenance of a natural style better over time anyway. There is no rule that says your hair has to be straight or black to be pretty, so keep that in mind as you plan your future haircare regimens. While your hair and scalp are recuperating pick up a few natural hairstyle magazines from the grocery store and see all the cute styles available now. Good luck, and please take my suggestions to heart, because the future health of your hair and scalp may depend on it. I am so sorry this happened, it is absolutely traumatic. Everyone has great suggestions. Mine is vitamins and minerals to help nourish from inside out. Make sure you go to a very well informed vitamin & mineral store. Not WalMart. I do not have any ideas as to do with your hair at the moment but,as your hair grows in have your Doctor give you a prescription or buy over the counter ( unsure of price) Folic Acid.I use this because of certain presciptions I am on causes me to lose my hair.This has helped my hair alot.It is thicker and should help you also.I wish I could help you more!! I had this happen to me also one time when I was perming my hair. It started falling out. I guess it was too strong or something. I stopped using chemicals on my hair for a long time. I don't really color my hair anymore or highlight it like I used to. Just more content with the way I am as I got older, but I remember those days well. It will grow out! I had a time when I had a bad leg, and for some reason the meds made me sleep all the time, long story short, I ended up with a head sized tangle that wouldn't come out. I had it all cut by my husband and then I went to the salon to have it shaped. I suffered with the problem of hair loss. The middle part of my head has totally gone bald. So, I want to know is there any natural solution is available to grow hair? I don't know if it will grow hair but you can stop hair loss with things like oregano oil or fenugreek. On the other hand, I have heard there is some benefit to using Minoxidil for minimal growth. I had taken a typhoid vaccine 20 days ago. Now my hair is falling so much. What should I do now? Which foods should I eat now? Please call your doctor immediately and explain your problem. Hair thinning is a possible side effect of contracting typhoid fever but may or may not be a result of a vaccination. There could possibly be another unrelated reason but your doctor will be able to help you. I agree that you should contact your doctor right away. Since it is the weekend and that may not be possible I would suggest that you visit your pharmacist and see what they have to say. They should be able to give you some quick advice as to whether this constitutes an emergency situation. I have heard that sometimes things like this "mimic" the disease and goes away after a short time. But please seek expert advise so you can be sure everything is okay. I had a problem with my thyroid and started losing my hair - my doctor advised me to take 1000 to 5000mcg of Biotin daily. I did not see results right away but can now say (years later) that my hair and nails are in great condition. (I am 80 years old.) Biotin is inexpensive so maybe you could give it a try when you are feeling better. Re Biotin-wedmd.com has good information about Biotin but advises that you should discuss taking it with your doctor because of possible problems if you have other medical conditions and also possible interactions with drugs you are taking. I hope that you have called your doctor already. If you are interested in Biotin and any other supplement, please discuss this with your doctor. What can I take to prevent hair loss? It would depend on what is causing the hair loss. Some medications cause it, in some people it is stress, Sometimes it is genetic. There are several items along the lines of Rogaine, but once you start using these products you have to keep on using it or the loss will start up again, and some people have told me when that happens it is worse. I have learned to live with mine, and I have a couple spots that are almost bald. I am on a couple prescriptions that cause it. Hey girls, try biotin 5000 mcg and folic acid 800 mcg, and try to eat the food which contain more protein. Hair is made of protein. Best of luck. Hope it works for you. I went through a crazy hair dyeing experience and basically all the hair on the top of my head fell out. So I have shoulder length hair, but the top of my head looks like it's been buzz cut! I'm embarrassed. Does anyone have any solutions on how I can fix this? Thank you. Wear hats, wide headbands...Biotin capsules will help it to grow back faster. Large headband and a scarf tied around your head. I am suffering from hair loss so please give me advise how to stop this and also some food and home remedies as well. Hi - I had always had very thick hair until a few years ago when I developed a thyroid problem. My hair started falling out by large amounts with every brushing and my doctor really had no advice except to wait until my medication took effect and maybe that would stop the thinning. A friend told me to try Biotin as that had helped her. I have now used Biotin for several years and my hair is back as thick as before and I see only a few hairs with each brushing. The following is some information I found on a doctor web site that I give to all my friends who have this problem. I take a Biotin supplement of 5,000 Meg a day and it has helped my hair and my nails to return to a healthy state. Biotin: This is a B vitamin of importance for healthy hair. Good sources of biotin include: brewer's yeast, bulgur wheat, lentils, sunflower seeds, soybeans, and walnuts. Try Google with "how to stop hair loss" and you will see a lot of information (including ads) but you will also find a lot of good info. I have thin hair (it's a family curse! ), but I've used Minoxidil (generic brand of Rogaine) for several years and it seems to help as long as I use it every day. I use it before I go to bed. Hope this helps you! How do I stop my hair from coming out in the middle of my head? There could be many reasons for your hair loss. Please see your doctor as soon as possible for an evaluation and possible medical treatment to resolve the problem. My friend has difficulty with her hair. It is tangling and she is having hair loss. Rub peanut on her head. My nanny used to do it with my uncle all the time in Venezuela, and by Jove it worked. Good luck! How can I treat falling hair? This problem occurs especially in summer. After a shower I can see 50-100 hairs have fallen. Usually I see them in my bedding. On the floor I can see so many hairs have fallen every day. My hair is also very thin and of medium length. In particular I do not have much hair in the front area of my head. I do not have any bad disease that requires any strong medicine. But I have had straightening done on my hair some time back. I am very frustrated. Please help me. Does anyone have the same experience? Do you know of any home remedies or medicine that might help? Thank you. First and foremost, stop stressing yourself out! That leads to hair loss. So relax and try out the following things. Massage your head with olive oil once a week, not only do head massages feel awesome, but they stimulate the scalp resulting is better hair growth. Stop buying shampoos with sulfate laureth. It is the chemical in soaps and shampoos that strips the dirt and oils from the hair which tends to dry it out. Try only conditioning the hair that falls below your ears, as the hair that is near our scalp tends to be oilier naturally. Do not brush your hair while it is wet. Instead take a wide toothed comb and run that through your hair post shower/wash. We all lose about 100 strands of hair from our head each and every day and it's completely normal! We have over 100,000 hairs on our head so it's nothing to worry about! Those hundred hairs we lose a day are part of about a seven year cycle and is the age of those particular hairs that fall out and then new hair begins growing in those follicles that they came from. It's a natural and balanced cycle. Any hairstylist who paid attention during their physiology classes in cosmetology school will verify that for you. My classes were 40 years ago and I still remember. The key to your problem was when you said your hair on front was very thin and it keeps breaking. You need to get a complete hormone test not by a man, but a female ob-gyn because the female hormone estrogen (lack of) or progesterone (male hormone) all combined with thyroid and probably yours is related to thyroid hormone will cause breaking, thinning, and complete hair loss. I spent 7 years with what you describe and once I got them balanced I don't lose my hair and the thinning has stopped, I can actually have a hairstyle and perm if I want now. You are right it is not normal to be this way so have it checked very soon. It also helps with nerves because you suddenly are a lot calmer and you see things differently. I couldn't believe the difference in just 1 week. How can I avoid extreme hair loss? It can mean many things. You didn't say if you are a man or a woman and you didn't say how old you are. I am a woman and have had hair loss for about 18-25 years. It would fall out and then grow back, sometimes I was almost totally bald. For me addressing adrenal fatigue, hypothyroidism helped. Eventually I found out that I have SLE, systemic lupus. 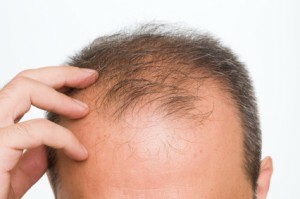 Hair loss is one of the main complaints with this disease. Does anyone help me for my hair? I had a long and thick hair until 2 years ago. Now I am losing my hair. It is too much. I have been losing my hair for 3 month. I am eating good food and sometimes vitamins. Can somebody tell me what I can do to stop the hair loss?